Growing up my mom has always had a little curry leaf plant somewhere in the kitchen. It's just been in the background, never bothering anybody. The leaves themselves are fragrant, but unless you make it a point to smell them, they won't intrude. In fact they become more aromatic once they have been plucked or cooked. On many occasions my mom would send me to the plant and ask me to pluck a few leaves off for whatever dish was on the stove. I remember smelling them in my hand from the moment I plucked them till I handed them to her. I'm always amazed at how scents evoke such vivid memories. To this day when I smell them it takes me back to those days. They are used for seasoning many Indian dishes. Thrown in when sauteing the onions, cumin, and mustard seeds, adding the subtlest flavor. When one comes across them while eating, they politely put them on the side of the plate and continue on with their morsel. When I first moved to Bellingham, Wa, there were no Indian stores around for me to get a fresh supply of curry leaves, and I would often omit them from my Indian cooking. To be honest, I never noticed their absence, but I did feel guilty for not adding them in the dish. It made me feel less authentic as an Indian cook. Now that I'm in Seattle, I do have Indian stores a little more available to me, but I find myself not using all the curry leaves before they go bad. I've been freezing them, but I feel that some of it's potency is lost. My mom just sent me way too many fresh curry leaves and for two days I was distraught at the thought of them being stuck in the freezer, losing it's vigor. Then today, I had a brilliant idea. I am going to dry them. I have them all laid out on napkins in a single layer, and just letting them dry overnight. I'm actually very excited to see how they do when cooking. 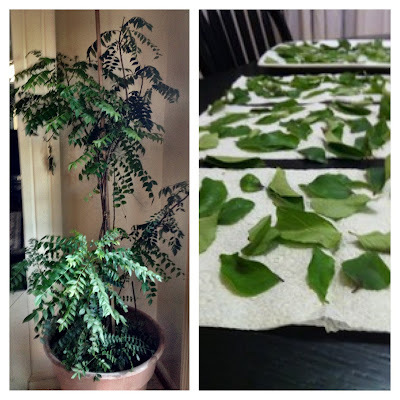 My mom's curry leaf plant and my attempts to dry some.